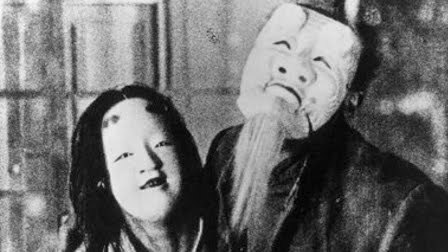 WIKI: A Page of Madness (狂った一頁, Kurutta Ippēji or Kurutta Ichipeiji) is a silent film by Japanese film director Teinosuke Kinugasa, made in 1926. It was lost for fifty years until being rediscovered by Kinugasa in his storehouse in 1971. The film is the product of an avant garde group of artists in Japan known as the Shinkankaku-ha (or School of New Perceptions) who tried to overcome naturalistic representation. The film takes place in an asylum. Although cut together in an ever maddening maelstrom, the film loosely tells the story of the janitor of the asylum. His wife is one of the patients. One day their daughter shows up at the asylum to tell her mother about her engagement. This sets off a number of subplots and flashbacks which stitch together the family history.